"All Falls Down" is a song by American hip hop artist Kanye West. It was released as the third single from his debut album, The College Dropout. The song was produced by West and features singer Syleena Johnson. It was released in February 2004 and entered the UK Singles Chart at number ten and peaked at number seven on the US Billboard Hot 100 on May 11, 2004, his first Top 10 in the USA. The song was nominated for Best Rap/Sung Collaboration at the 47th Grammy Awards. The song features an interpolation of Lauryn Hill's "Mystery of Iniquity." Kanye originally attempted to acquire legal clearance to sample the recording but due to various complications, the permission was withheld. West then called upon Syleena Johnson to re-sing the relevant vocal portions of "Mystery of Iniquity" which ended up in the final track. The version of the song with the original sample can be heard on West's Freshman Adjustment mixtape. Lyrically, "All Falls Down" examines the self-consciousness and insecurity within society, particularly the black community, and how these characteristics pertain to economic materialism. The music video for "All Falls Down" was directed by Chris Milk and shot at Ontario International Airport in Ontario, California. It follows Kanye as he accompanies his girlfriend, played by Stacey Dash, to the airport to catch her flight. The music video is shot in first-person perspective, displaying the journey from their car to the airport terminal through West's eyes. The video also features cameos by Syleena Johnson, Common, and Kel Mitchell, who act as a ticket counter, gate agent, and valet, respectively. In addition, rappers GLC and Consequence can also be seen as Kanye is running through the airport in slow motion. ↑ "Kanye West nets 10 Grammy nominations". MSNBC. December 7, 2004. Retrieved January 9, 2011. ↑ Reid, Shaheem (February 9, 2005). "Road To The Grammys: The Making Of Kanye West's College Dropout". MTV. MTV Networks. Archived from the original on January 16, 2009. Retrieved January 4, 2009. ↑ Hall, Rashaun (January 21, 2005). "Kanye West Collaborating With Lauryn Hill On New LP". MTV. MTV Networks. Archived from the original on January 14, 2009. Retrieved January 4, 2009. ↑ Heaton, Dave (March 5, 2004). "Kanye West The College Dropout – PopMatters Music Review". PopMatters. PopMatters Media, Inc.
↑ Reid, Shaheem (August 25, 2005). "Kanye Puts It All On The Line — For A Video: VMAs Behind The Camera". MTV. MTV Networks. Archived from the original on January 16, 2009. Retrieved January 4, 2009. ↑ The College Dropout (Media notes). Kanye West. Roc-A-Fella Records. 2004. 986 173-9. 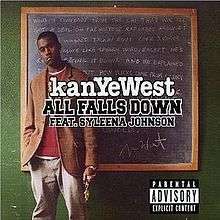 ↑ "Kanye West and Syleena Johnson - All Falls Down". aCharts.us. Retrieved August 3, 2007. ↑ "All Falls Down - Kanye West". Billboard. Nielsen Business Media, Inc. Retrieved August 3, 2007. ↑ "Ultratop.be – KanYe West feat. Syleena Johnson – All Falls Down" (in Dutch). Ultratip. ↑ "Ultratop.be – KanYe West feat. Syleena Johnson – All Falls Down" (in French). Ultratip. ↑ "Dutchcharts.nl – KanYe West feat. Syleena Johnson – All Falls Down" (in Dutch). Single Top 100.